Sunday night. October 19th. A distraught man with a weapon is threatening himself or others. City police cordoned off the area of downtown Plattsburgh where the man lives, an apartment building on City Hall Place. Some officers (SWAT team) are hidden behind the bushes, ready to respond. Anyone entering the area is told to leave. Other officers go door to door to warn people about the problem, to stay inside or leave. Eventually the distraught man is taken to the mental health unit at the hospital. Obviously, a sketchy story. How much of it is true? I don’t know. (Plattsburgh City Police have a SWAT team?) Maybe a minor incident was blown of proportion. But all the buzz indicates that something serious went down. In the meantime the rumors are flying. Why? Because Plattsburgh’s daily newspaper, the Press-Republican, never published any details. The story might have been covered on a local TV or radio station but usually I don’t use those outlets for news. The Plattsburgh TV station, WPTZ, usually reports on Vermont events to the detriment of its Plattsburgh coverage. WIRY, Plattsburgh’s Hometown Radio, doesn’t cover the news like it did in the old days. During its news spots the DJ sounds like he’s reading edited versions of Press-Republican articles. One theory is that the confrontation involved someone with mental health issues and so to spare that person the story was overlooked. In that case, just don’t publish the person’s name. But why should the newspaper bother to cover the incident at all, especially if it’s only a wild tale? Simple. News on the street isn’t real news. The role of the news media is to get the facts and set the story straight, instead of letting the public rely on rumors for info. One rumor says the distraught man evaded the police and was caught in another part of town. OK, that makes the city police look bad. But what if the rumor is untrue? Despite doing a good job, the Plattsburgh Police Department ends up looking incompetent. The public does have a right to be informed. Citizens should be aware that even in prosaic Plattsburgh things on occasion get edgy. People shouldn’t be getting their news on the street. But this won’t change until the local media and law enforcement officials decide to serve the public and let the sunshine in. NOTE: Before I posted the above article, I decided to sniff around the Internet to see if any local media did report on the story. I do read the Press-Republican every day but sometimes an item will slip pass me. With the caveat in mind that not everything is put up on the website, I searched the PR’s site with key words like “Plattsburgh police,” going back to November 19th. Nothing popped up in either the main articles or the Police Log. Ditto for Cardinal Points at PSUC. I also checked the dot coms for the local TV stations: WPTZ, WCAX, and WFFF. I found nothing about the incident in their news sections. So all that is left is rumor. Grab a returned book. Scrape off the DATE DUE sticker. Repeat. Repeat a 100 or more times an hour and you end up a good pile of stickers. Besides tossing them into the trash, maybe they could be recycled. Inspiration struck a Plattsburgh Public Library employee. Art. Halloween art. during his talk at the Plattsburgh Public Library. What cinched it for Bill Lowe was seeing his name in print. At first he wasn’t interested in writing because he would have to stay after school. But his English teacher saw in Bill a talent for words and she convinced him to write for the high school newspaper. And after his byline appeared in the paper, he experienced that moment that only a writer can understand. Last week Bill spoke at the Plattsburgh Public Library, talking about his writing career and reading one of his short stories. He described his journey from being a student reporter at an Arkansas high school to a published writer whose byline has appeared in Alfred Hitchcock’s Mystery Magazine. After serving in the Army Air Corp during World War II, Bill attended college, followed by a career in advertising. After he retired, he and his wife moved to the North Country. Now he had the free time to write. But he made sure to make good use of his time. Certain days and hours were set aside for writing. He couldn’t be disturbed during those periods in his schedule. There was more to it than just sitting at the typewriter. Research was important. Hitchcock’s Mystery Magazine wanted accuracy when it came to law enforcement procedures. Bill made contacts with the New York State Police. When he was granted an interview, he brought along a clipboard with a list of questions, ready to take notes. His preparation and professionalism would impress his contact, making it easier to gather the background information he needed. Also, his research with the State Police would help spark ideas for stories. One trooper he knew was assigned the task of getting rid of confiscated slot machines. The machines were illegal, a tempting target for organized crime. But how to get rid of them? This real life incident became the basis for one of his stories. Besides crime mysteries, Bill has also dealt with the supernatural. Ghosts have played important roles in some of his stories. He read A Very Peaceful Place, a tale about a new spirit to a rural Vermont graveyard who upsets the tranquility enjoyed by the other ghosts. The man, an advertising executive from the big city, was passing through town when he died in a car accident. As a modern ghost trained in Madison Avenue techniques, the newcomer knew that fear didn’t motivate people: guilt did. He explains to the other spirits how an ad using guilt would motivate a parent to buy a particular brand of toothpaste for his child. After all, the parent wanted only the best for his kid, especially the whitest teeth. Looking for an Achilles heel of guilt, the newcomer haunts the living, motivating them to renovate the old cemetery. One suspects that Bill’s long years in advertising helped to create the pointed but humorous dialogue uttered by the newcomer. As they say: write about what you know. Bill Lowe is the author of three anthologies: After The Summer People Leave, In Case of Ghost, and Felony in the Forest. These titles are available at Borders Bookstore, Champlain Mall, Plattsburgh. Busted binding. Shredded pages. Encyclopedia volumes beyond repair. In a perfect world someone wouldn’t take out his anger on library books. But damaged books are another cost for the Plattsburgh Public Library. Apparently the vandal was getting even for violating the library’s rules pertaining to the use of the public access computers. After he was caught, he extracted his revenge, finding a secluded corner to do his handiwork, and then he hid the evidence. He picked his targets well. An encyclopedia set with destroyed volumes is just as useless as one with missing volumes. The whole set would have to be replaced at considerable cost. But he didn’t win. The encyclopedia sets he damaged, while important, aren’t irreplaceable. Ironically, what started with computers ends there. The information the petty vandal tried to destroy is still available on the Internet through the library’s computers, far beyond his reach. Exiled mobster Lucky Luciano was stuck in Italy. And with him, Ben Morreale. And so Luciano remained trapped in time and space, 1940s Italy. History marched on but not Ben’s story. Writer’s block. I understood Ben’s situation. I met Ben in the latter part of his life. He was from a different generation, born in the 1920’s. 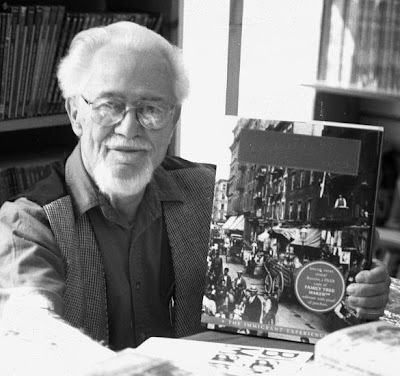 During his early years he watched the communists in his Brooklyn neighborhood march in the May Day parades. In those days communists weren’t completely demonized. But that would change. Ben served in the Pacific Theatre during World War II, building airstrips. One time he ran for cover when a Japanese plane strafed the field. “I always wanted to meet that pilot and thank him for missing me,” Ben would say. After WW II came the Cold War. West versus East. Democracy versus Communism. Opposing ideologies, each backed up with nuclear weapons. “You better go to Europe before they blow it up,” advised one of Ben’s college professors. Thanks to the GI Bill, Ben ended up in 1950s Paris. He was among other American expatriates like George Plimpton and Max Steele, founding editors of the Paris Review. Ben was an angry man but, as he explained, he channeled his anger into his writing. He wrote a short story simply entitled “Hate” that appeared in the Paris Review. After his Paris days Ben became a college professor, teaching at Goddard College in Vermont and then at Plattsburgh State in New York. I first “met” Ben through one of his books, “Down and Out in Academia.” It was a fictionalized take on his teaching experiences, particularly his time at Plattsburgh State during the Vietnam War era. It was not well received, at least officially. One day when Ben was playing tennis, he crossed paths with the college president who knew about Ben’s scathing book. He smiled. It was worth it. I met Ben personally through a local writers group. He talked about the difficulties he faced, an older writer trying to find an agent or publisher. Publishing was all about new talent, young authors. But Ben persevered. Other books made it into print, including La Storia, a non-fiction work he co-authored about the history of Italian-Americans. But, as it does for all of us, time was catching up with Ben. He walked slower, used a cane. He was retired from teaching but not writing. Sometimes he mentioned a work in progress, a novel about Lucky Luciano, fiction mixed with history. The story had stopped with the mobster’s deportation to Italy. The exile was stuck in a house with his maid, a situation devoid of conflict and action. Ben would wait at his keyboard, hoping for the words to come that would free Lucky. Bits and pieces of Ben’s memory faded away. Facts, dates, miscellaneous data. Then people. The last time I spoke with him was at the coffeehouse one afternoon. Even though I had known him for years, he didn’t remember me. “Were you one of my students?” he asked. But despite all the changes, Ben was still Ben. He was courteous, didn’t act angry or annoyed that I was a lost memory. Instead, he was amazed that I knew so much about him while he couldn’t recall my first name. He appreciated my interest in his work. I would see Ben at the coffeehouse on occasion but he didn’t recognize me, despite our re-meeting. I was a complete stranger. When he still knew me, Ben said that he found an unpublished novel in his possession, one that he had forgotten he had written. A writer can forget his own creations. Even though I had never sat in his class, Ben taught me one important truth. Memories fade, people die. But the written word lives on. A surfeit of books. No more room at the Cornerstone Bookshop. Instead of tossing them into the trash, the downtown Plattsburgh used book store puts them into a FREE BOOKS area on the sidewalk. People who come along can take whatever they like, giving the tomes a second chance at life. But sometimes the FREE BOOKS boxes become too jammed, a surplus of surplus. And some books, even for no charge, are unwanted by the average reader. For example, what to do with a set of outdated law books? Simple. Hold a book art contest. Take home a book, decorate it or utilize its material to create art. The response was surprisingly great. See the photographic evidence below. The winners were chosen through the court of public opinion, i.e., customers voted for their favorite. Great. Now they’re littering my ATM. I wonder if the security camera recorded the lazy slob who couldn’t carry his cash and snack at the same time. After all, both types of dough are so heavy. The downtown-enhancing strips of wild weeds are gone! Apparently under the cover of night vandals showed up with weed whackers and lawn mowers, laying waste to the WEXPO – the Weed Expo – on the corner of Cornelia and Margaret Street. All evidence was removed; the sod was cut bare. The wild weeds were reaching their full potential, growing so high that they would have dominated the corner. Of course, such tall plants would’ve obscured the view for drivers, creating a dangerous blind spot, but that’s a small price to pay for the lovely ugliness of ragged ragweeds. But don’t despair: the vandals didn’t cut down all the weeds. The flowerbeds were untouched and you can still enjoy the grotesque beauty of pest plants. Why cut loose with sunbright carnations and other vibrant flowers when mopey milkweeds will do?